This needs no further caption. UPDATE TO THE UPDATE: I’ve now written about Reagan’s birthday for the past three years, and I like the concept of using this as a way to both examine my thoughts through the years and to add to them as well. A previous post with both of my previous posts is here. This is even more fitting, now that I’m in Illinois, which is of course where he was born. One of the houses where he grew up was even located on UChicago’s campus…although it’s been destroyed. With everything that’s been going on in the world, from Russia to the Middle East to Europe to just about everywhere else, the need for strong American leadership couldn’t be more clear. With that in mind, it’s worth looking at Reagan’s 1985 State of the Union address on its 30th anniversary, where the Reagan Doctrine was announced, and looking at how a few of his pieces of wisdom are still extremely relevant today. With ISIS’s rise in the Middle East, this statement still rings true. There is no substitute for eliminating this menace, and force is the only thing they will respond to, as Jordanian airstrikes have shown. Similarly, when dealing with an Iran that is unrelenting in its pursuit of nuclear weapons, there is ultimately no substitute for preventing them from acquiring a nuclear weapons capability. Sadly, our negotiations (and their repeated extensions) are only helping Iran continue to progress towards their final goal. Senator Tom Cotton also reminded the nation of the dangers that closing Guantanamo Bay for political reasons poses earlier this week. In his speech itself, Reagan declared that “We must stand by all our democratic allies.” This seems like a relatively non-controversial statement, but given the pettiness with which the Obama Administration has greeted Israeli Prime Minister Benjamin Netanyahu’s impending speech before Congress, it seems we need to be reminded of this. Although we do face some extreme challenges in the years to come, Reagan ended his speech on a positive note. Even in the middle of the Cold War, he realized that we will always emerge stronger from these challenges. 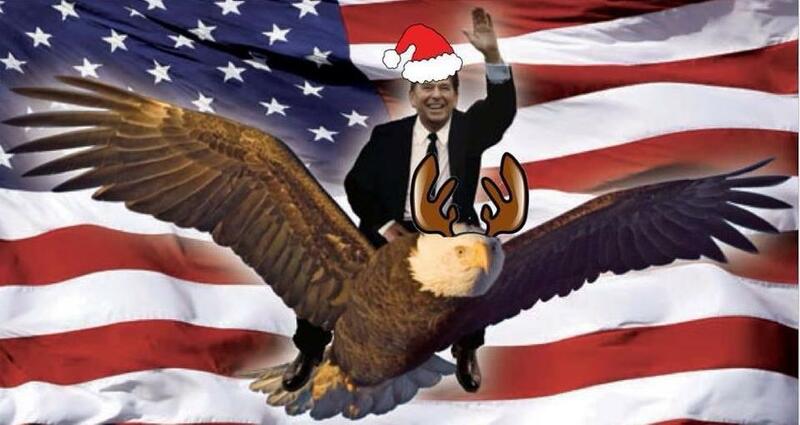 With all of this said, I’d like to wish a happy 104th birthday to Ronald Reagan. I’ll be back next year. UPDATE: Although it has been a year since I wrote this piece, on Reagan’s 103rd birthday, I believe the message to be as true as ever. Upon some reflection of the text below, many of the congressmen I cited here have announced they will retire after serving through the end of this term (such as Matheson and McIntyre), with others such as Iowa Republican Tom Latham joining the rush for the exit. I saw Senator Ted Cruz speak today about the dangers of Iran acquiring nuclear weapons, and he fittingly pointed out that history has shown President Reagan’s peace through strength philosophy to be the one that will prevail. He pointed out that there is nothing dedicated to Neville Chamberlain, because appeasement in the face of evil serves only to embolden said evil. One a lighter note, the other significant thing I have learned about today in the year since I wrote this is that it is also Governor Scott Walker’s anniversary, and I wish him the best as well. Feb. 6 is a special day for me, not only as a Republican, but also as an American. On this day in history, 102 years ago, in Tampico, Illinois, Ronald Wilson Reagan was born. Little did his parents know that their son would go on to make history and shape the course of world history as we know it. In the years since his birth, Americans, and indeed the world, have recognized Reagan for his brilliance. Not only did Reagan pave the way for the future of conservative economic policy due to the resounding successes of Reaganomics, sending the Soviet Union to the great ash heap of history, but he also had a joke or two (or several hundred) on hand to diffuse even the greatest of tensions. There are two particular aspects of Reagan’s time in the Oval Office that both congressional leaders of both parties and President Obama would be wise to heed. The first is sadly lacking, as former Senator Chuck Hagel’s (R-Neb.) performance during his confirmation hearings for Secretary of Defense demonstrates. Chuck Hagel once penned an essay for a book entitled “Why I am a Reagan Conservative,” in which he defined his conservatism in terms of “individual rights, limited government, free trade, fiscal responsibility, balanced budget, and limited foreign entanglements.” While I agree that these are some of the hallmarks of conservatism, Hagel’s worldview simply is not on par with that of Reagan, who believed in a strong projection of American force, that ultimately caused the collapse of the Soviet Union. Republicans are wise because, for the most part, they oppose Hagel’s confirmation, whereas Democrats are lining up behind him for reasons I will never fully understand. On today of all days, however, I would suggest that all of Hagel’s backers thoroughly reexamine his background to see if he is suitable to take over at the helm of the Pentagon. Reagan’s get-togethers with Tip O’Neill (D-Mass. ), the Democratic Speaker of the House during most of his administration has become the stuff of legend (partly because it is just that: a legend), and both Republicans and Democrats wax nostalgic about the days in which partisans on both sides could have a drink together after work, as opposed to the current 24/7 campaign, with politicians of all stripes seeking higher and higher office, instead of caring for the very people who gave them this power in the first place. Reagan’s friendship with O’Neill serves as a reminder that, regardless of political disagreements (and the disagreements between the iconic conservative and liberal icon were many and far-ranging), Washington wasn’t always the toxic environment that so many Americans view it to be. We currently live in an age in which traffic jams, NFL replacement referees, lice, root canals and, much to the chagrin of every child, brussel sprouts are more popular than Congress. Did I mention that Genghis Khan is also more popular than Congress? To put it simply, the American people are sick and tired of hyperpartisanship and representatives who are more willing to demonize their opponents than they are to actually get work done. Moderates on both sides of the aisle are diminishing, due to primary challenges from the ideological extremes or defeats in the general election. On the Democratic side, the Blue Dog Coalition is losing members at an astonishingly fast rate. This past cycle, Congressman Jason Altmire (D-Penn.) lost renomination to Congressman Mark Critz (D-Penn.) because he was insufficiently liberal. The other centrist Democrat whom I am sad to see go is Rep. Larry Kissell (D-NC) who was, in essence, gerrymandered out of office. Virtually the entirety of the Blue Dog Coalition is going to be targeted in the midterms of 2014, and losing stellar congressmen such as John Barrow (D-Ga.), Jim Matheson (D-Ut.) and Mike McIntyre (D-NC) would be a shame for America as a whole. On the Republican side, one need look no further than the Indiana primary of 2012 to see the risks hyperpartisanship will continue to pose. Respected six term Senator Richard Lugar, who, in addition to being my personal hero, has served as a respected bipartisan voice on Capitol Hill for decades, lost his primary to an utter nutcase named Richard Mourdock. In the Massachusetts Senate race, my other favorite senator, Scott Brown, lost his reelection bid to an uncompromising liberal superstar, Elizabeth Warren. In both these instances, voters rejected two senators who epitomized Reagan’s approach to a willingness to cooperate and reach across the aisle with two candidates who are far beyond the mainstream of American politics, and American democracy suffers as a whole. In a time in which Asian warlords are viewed more favorably by the American people than the very governing body dedicated to representing them, a return to the civility of the Reagan era should be welcomed by all, and the anniversary of his birth provides us with a perfect opportunity to do just that.